Next ›Don’t Have Enough To Worry About? Watch The Discovery Channel. That pretty much sounds like my life! I have an 18 month old who is going through the independent phase and the whole shirt issue is a huge one with him, but even bigger is food. And now I have a one month old who will soon be following in his big brother´s footsteps. I really wonder what I was thinking sometimes! Too funny! Boy can I relate! For the 10th time, I don’t know WHY, okay? I don’t know the answer to anything! Is my shift over yet? This wasn’t on the motherhood syllabus! I LOVE THIS! My 4 year old is constantly asking questions and by the end of the day I’m spent! Boy do I know this rollercoaster. My ride is the extreme, my-kid-didn’t-get-enough-sleep version today. Guarenteed to have the best highs and lows and quite the interesting soundtrack of all the best whining but you gotta love that sweet innocent sleeping end every time. And just like any good roller coaster, we want to ride it agan and agian and will be oh so sad when the park closes and the ride is over! Great post! Oh my god this si soooo good!! I never read anything before that really said how I feel exactly every day of my kid’s life.. sure it is a roller coaster, you are good! When my son was an infant I would throw, I mean hand over, him to my husband as soon as he come home. I needed a break. Now that he is older I tell him that I’m off duty at 9pm and will reopen at 6am. Your post was perfect in describing the many ups and downs of being a mom. Great job. I can totally relate – x3! Hey, at least you started and ended the day on a good note! Mmmhmmm. I know just whatcha mean. I used to want to tell my kids, “Parenting is closed now, but will commence tomorrow morning at 7 a.m.”. Oh, Thank you – I needed this! I haven’t been able to think coherently for months now… But you’ve just put it all in perspective, and I so relate to this post. Mine just turned Three. He cries over clothes too. What the heck? And then he rubs the back of his hand across my cheek and says, “Mommy, you are so sweet!” and I melt, and I want to hold him forever!! I remember this one… cracked me up! Thanks for the reminder!! This sounds like my day. Every day. My son is lucky he looks like an angel when he sleeps. If we didn’t end the day on a high note, he might occasionally be in danger of being sold to gypsies at midnight. After which I would immediately be sad, and have to hunt them down and steal him back. Loved this post! You are so right…it is full of ups and downs! But it is the greatest, most rewarding thing ever, isn’t it?! Thanks for the post. It really does answer the question: “What do you do all day?” Hilarious post! Too funny! Thanks for the laughs! Oh, very funny and right on… LOL… I loved it (and, unfortunately, recognized it). You have just described every day of my life for the last 18 years. So glad to know I’m not alone. I don’t want to get back on at 7am tomorrow. I don’t. I just for really, really don’t. Most definitely an excellent description of life with a preschooler…from reading your blog, sometimes I start to think that life with Sean is rather idyllic…this helps me to know that you have days like all of us do. 🙂 Thanks for the smile. I LOVE YOUR BLOG. You are absolutely hilarious! We hear you! Isn’t it a great club? Did you read my mind today? Started reading your blog a few weeks ago. Sorry for lurking. Shameful. Anyway, I just have to comment on this one! You are TOO funny! Any time I need a break from my three year old and 8-month old, I come to your blog to see what hilarious encouragement you can give me! You just described my day in perfect detail…are you reading my mind?! Thanks for letting me know I’m not insane…just a teensy bit crazy like most moms. I’m right there with you! Good to know I’m not crazy! I am very familiar with the roller coaster syndrome you describe, and no matter how old your kids get, the ride just keeps going!! I am riding the “teenage” roller coaster now-wheeeeee!! Are you tired of hearing that you are the best writer ever? Yup. That pretty much sums up motherhood. It is still true. Oh so very painfully true. My husband wants to publish a book titled, “1001 Answers to the question WHY?” What do you think? Tee hee. I do this, too. Yesterday, in the same conversation I was telling my husband how unmanagable our one year old is sometimes/wondering if his behavior is normal and agreeing that we should have another baby/wishing we could just clone this one. It’s definitely a roller coaster. Thank heavens the highs are so lofty and thrilling. They TOTALLY make up for the occasional lows. I laughed out loud when I read this! I can relate…five times over. At this moment I have a three year old sitting on the potty trying to produce more “pee” so he can flush the toilet by himself. I accidently flushed it for him. Heaven help us! So true! It’s good to know I’m not alone… or bipolar. One of my favorite AM posts ever–“Am I still speaking English?”…that still makes me laugh out loud! Like the saying goes: Who ever said parents “have” children? Isn’t it the children who “have” us? Tee Hee! I love. love. love. this post. No wonder we are mental mush by the end of the day. This is fabulous. I hit the Share button before I even finished reading because I had to get it to as many of my own blog buddies as possible. I constantly find myself checking to see if my shift is over yet. Would you believe they booked me for a double yet again today? That makes 1032 days in a row! I need to speak with management. However, I suppose the “overtime pay” would be those sweet “awww, look at him” moments. Better not rock the boat too much. Management can be a b*tch, anyway, especially if she hasn’t had her coffee. What a fantastic post! This is my life right now, as a teacher who decided to “take a summer off” and stay home with our three-year-old son. My sister introduced me to your blog and I have to say, it’s the best I’ve seen. I sat here this morning, reading your latest post and giggling…thank goodness I’m the only one in the office this early. 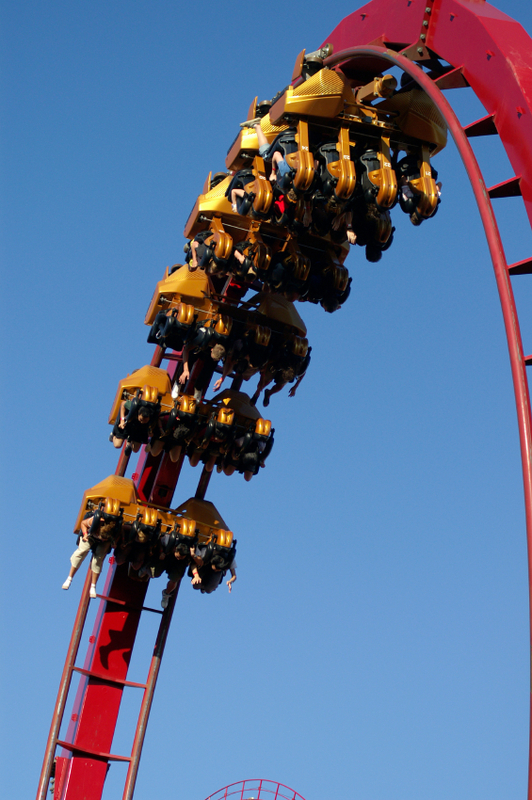 As a mother of four, I’m well acquainted with the roller-coaster syndrome…and I often feel like I should have had to pass a test before even getting on the ride. Your son is adorable, and your sense of humor will see you through many difficult times…even when something is not IMMEDIATELY funny, you’ll look back later and laugh. Fortunately, now I can laugh along with you. Keep up with the updates – I need all the laughs I can get!